LARGE parts of Western Australia are likely to be drier than average, along with western Tasmania and scattered parts of central Australia and Queensland which are likely to experience a drier-than-normal summer period, according to the Bureau of Meteorology’s latest climate outlook. December is also likely to be drier than average in northern WA and western Tasmania. However, eastern and central New South Wales, as well as eastern Victoria, are likely to be wetter than average. The rest of the country shows no strong indication of a wetter or drier month. The Bureau says warmer than average days and nights are likely for almost all of Australia for December to February. Development towards El Niño in the tropical Pacific Ocean continues, with outlooks suggesting El Niño conditions are likely through the summer months. 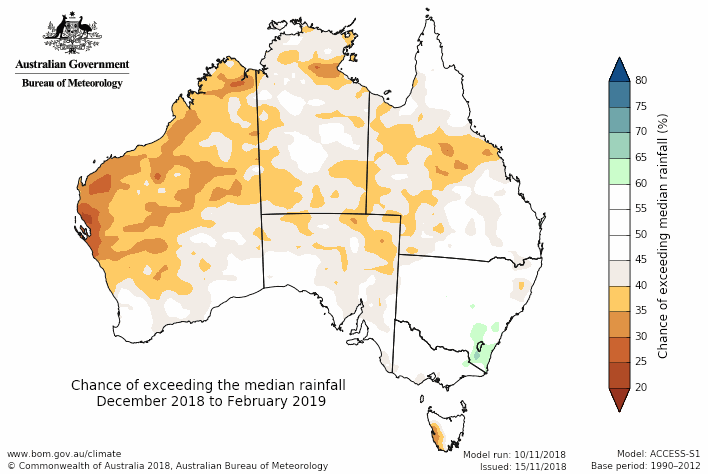 However, El Niño typically has a weaker influence in the current drought areas of south eastern Australia during summer than it does in winter and spring. A positive Indian Ocean Dipole (IOD) is currently underway and driving dry conditions in southeast Australia. However, models expect the positive IOD to follow its normal seasonal cycle, and decay in November or early December. A positive Southern Annular Mode (SAM) is likely for December, briefly driving a wetter pattern in some areas. See the Climate Influences section for more information.